I sell flowery, vintage-inspired jewelry (lockets, charm necklaces, rings, bracelets, earrings) ranging in price from $5 to $25. 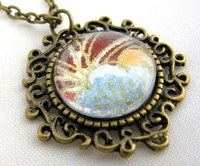 I use a lot of antiqued brass, whimsical charms, and flower beads. I will be joining the Bazaar December 12 - 14.